Recommended for daily usage, followed with KAO Nuance Airy Conditioner. Protein and moisture gives dry, brittle, color treated or damaged hair new life. Honey, hydrolyzed conchiolin and royal jelly extract provide nourishing proteins that penetrate hair follicles. Jumbo size pink pump bottle. Light aroma with a sweet note. With regular use, Nuance Airy Shampoo strengthens hair, improving softness and manageability. 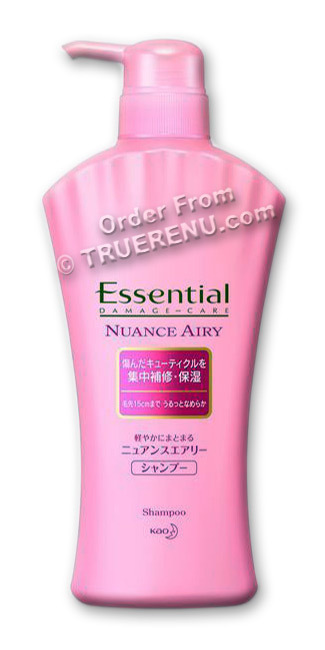 Works with KAO's Essential Nuance Airy Conditioner (Jumbo 530ml Pump Bottle: item 4121; Regular 200ml Tube: item 4123). A single pump's worth on wet hair should be enough lather for most. Massage well and rinse with warm (not hot) water. For best results, follow with KAO Nuance Airy Conditioner. Recommended for daily usage, along with KAO Nuance Airy Hair Treatment once a week or as needed. Ingredients: Water, ammonium lauryl sulfate, alchohol, glycol distearate, lauryl hydroxysultaine, PPG-7, honey, shea butter, lanolin acid, stearoxypropyl dimethylamine, cocamide MEA, lauramidopropylbetaine, dimethicone, honey, royal jelly, hydrolyzed conchiolin protein, rose canina fruit (rose hips) extract, malic acid, lactic acid, bis-methoxypropylamido isodocosane, toluene sulfonic acid, isodecyl glyceryl ether, bis-isobutyl PEG-14/amodimethicone copolymer, bis(C13-15 alkoxy)PG-amodimethicone, hybrid sunflower oil, benzyl alchohol, myristyl alchohol, polyquaternium-10, polyquaternium-7, guar hydroxypropyltrimonium chloride, PPG-7, PG, butylene glycol (BG), sodium laureth sulfate, laureth-4, laureth-16, laureth-23, sodium chloride, potassium hydroxide, phosphoric acid, sodium benzoate, BHT (butylated hydroxytoluene - a preservative), CI 45100, CI 15620, fragrance.